If you’re not familiar with QR Codes, pull up a chair, pour yourself a warm cider and follow along – you’ll be amazed and excited to get one of these onto your project! This is a QR Code. It stands for Quick Response. It is a symbol that your cell phone can read and direct your browser to a specific place on the internet. You can create them FREE! You can search online for sites that will allow you to create a QR code. The site I like best is http://www.qrstuff.com/. There you will find a step-by-step process to create your unique QR code. For this example, we will create a QR code that will link to my website: WendyAmato.com. First, use the link above to go to the home page of QRstuff.com. Under Step 1 “Data Type”, choose Website URL since we want the QR code to link to a specific page of a website. Next, in Step 2 “Content”, type or copy and paste the exact web address that you want to link to – in this case http://www.wendyamato.com/. Step 3 “Foreground Colour” is where you get to choose what color you would like your QR Code to be generated in. If you’re planning on printing in color – go crazy and pick something fun (maybe your logo color??? :)). If you’re planning on printing only in black and white, be sure to choose black (in the bottom left or right corner of the current color chart). Your QR Code preview shows on the right. You can now choose to download, print or email your unique code. I always download and save the code to my computer so I can use it how I wish, when I wish. If you choose “Print”, you will be prompted to set up your printer and paper right then. You may not be ready for this step so it’s a good idea to “Download” instead. You will be prompted to choose where you would like to save the file. Notice the file is a .png, not a .jpg. To change it to a .jpg, I opened up the .png file in Photoshop Elements, then clicked Image, Mode, RGB Color. Next, I saved it as a .jpg. Now, if you’d like to have your QR Code link to a video on YouTube, simply choose YouTube Video in Step 1! Woo hoo! Now you have a unique QR Code that you can use on your scrapbook layout, print and stick to the back (or front!) of your business card, sneak into your child’s lunch bag or do with however you choose. To view the webpage that your QR Code links to, you will need a QR Code reader App on your cell phone or tablet. Again, there are many free ones out there. ScanLife and QRReader are two that I have used. Once you open the app, your camera feature will turn on and you simply hover over the QR Code until it registers. You will be asked if you would like to go to that website. Yes! I saved the QR Code as a .jpg file and simply dropped it into the greeting card template just like a photo. I even made it red in Step 3! My QR Code links to a song on iTunes – “Have Yourself a Merry Little Christmas” by Little Big Town! Step 1 will walk you through the process if you choose “iTunes Link”. Get creative! You could take a fun video of the kids decorating the tree or sledding! Link to your family photo share site! So many possibilities! Have fun and let me know what you come up with! If you recall my post about the t-shirt quilt, you know that I’ll try anything once. In the case of the t-shirt quilt, I knew I would need to do this project twice. The first was for our son, the second would be for our daughter for her elementary school “graduation”. The first quilt was a challenge (to put it mildly) so I knew I would need to come up with a different method for the second. Voila! I was scrapbooking one weekend at one of my favorite places, The Scrapbook Manor, and Karen had a recently completed t-shirt quilt draped over a chair. I found my new method! Grab a cold lemonade and your stack of t-shirts and let’s get started! I started by cutting all the t-shirts down to size. I cut both the front and the back of each t-shirt at the same time with my Olfa rotary cutter. Once again, I used a 12″x12″ cardboard template from my scrapbook supply stash. Next, I sandwiched a piece of 11″x11″ batting in between each pair of t-shirt layers. I stitched both diagonals to hold the batting in place. If I had to stitch over a large area of screenprinting, I stitched on top of a piece of paper so the presser foot wouldn’t get stuck on the ink. Next, I laid all the squares out on the floor to determine their placement so no two similar colors would be touching, if possible. Starting with the top row of squares, I seemed the squares together with wrong sides facing so that the seem would be on the front of the quilt. I used a 1″ seam allowance. When I finished all the rows, I seamed each row to the next using the same procedure again with a 1″ seam allowance. With the t-shirts all connected into one blanket, I stitched 1″ from the edge all the way around the outside of the blanket. That was the easy part! Little did I know the next step would take 5 times longer to complete! Next, I used my favorite Fiskars scissors to cut a fringe in each seam taking care to stop short of cutting through the stitching. Once that process was complete, my T-shirt Quilt #2 was finished! Much easier than the first! Give it a try – you know you have the t-shirts! Well, you know me… I love to take those resale shop finds and turn them into useful gems. Here we go again! I found this yellow and white stripe bedskirt and fell in love with the fabric. Our daughter spends her summer days out front holding lemonade stands so I thought the bedskirt might make perfect accessories for her “business”. I started by laying the bedskirt on the folding table she typically uses. I took advantage of the corner that was already seemed. By folding and pinning the remaining corners, I knew exactly where to sew the seams to create a perfect fit. Once seemed, I cut the excess fabric away. With the excess fabric, I cut triangles for the flag banner and a rectangle for her money/pen pouch leaving some of the lining fabric attached to use for the rope casing. A few yards of cotton rope and it was all finished. The banner hangs from a tree to her umbrella and completes a very professional-looking lemonade stand set-up. Stop by for a cool, refreshing glass this summer and if you’re looking for more fun ideas, subscribe to my blog or check out WendyAmato.com. What a crazy month! Looking back, I’m so glad I documented it. After the month we had, we’re really looking forward to a great new year. I hope your holidays were wonderful and if you need help getting all those pictures organized and into albums, click on over to WendyAmato.com and get in touch with me – I’d be happy to help! My December Daily album is finished! It was a good exercise. You should try it sometime. Better yet, give me your pictures and I’ll make an album for you! For more information and inspiration, visit my website, WendyAmato.com. Happy New Year! 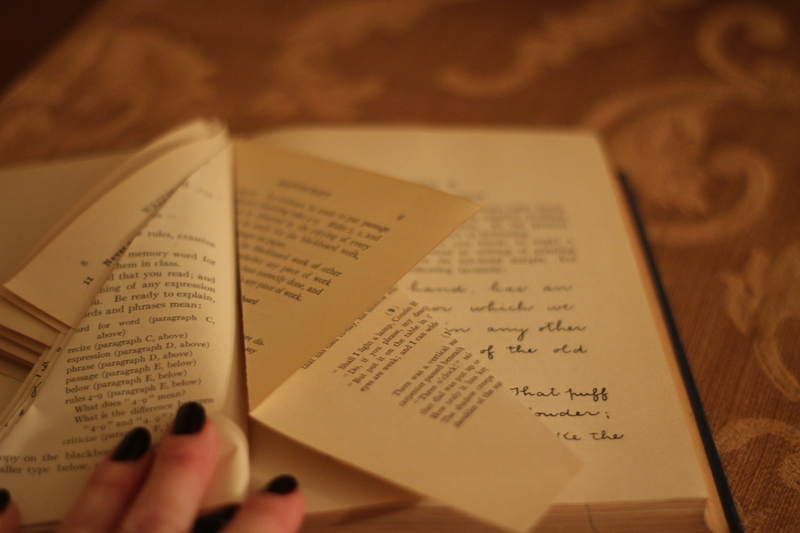 Start with an old book. Mine has 300 pages. 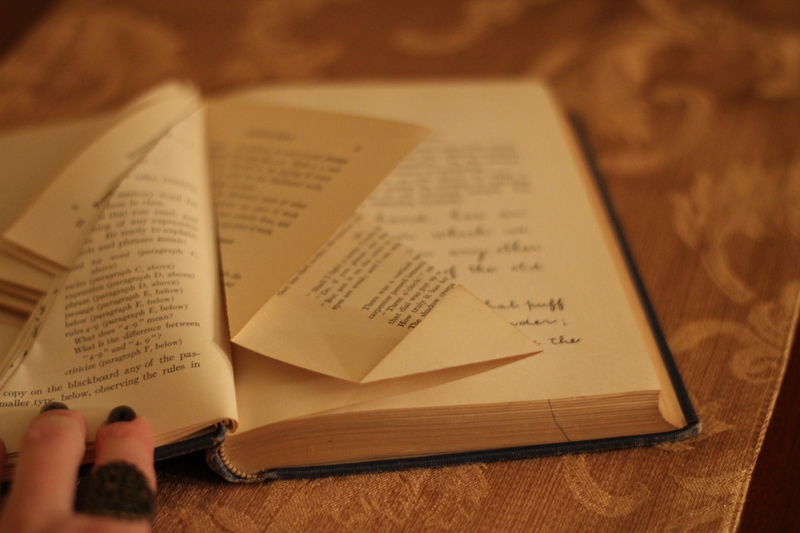 Don’t choose one with brittle pages – they will crack when you try to fold them. 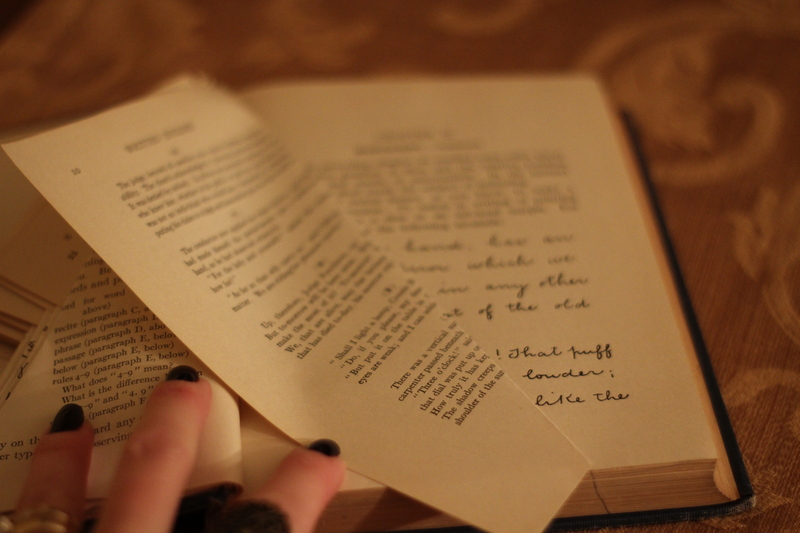 Older books with yellowed pages look really neat but any book will work. Draw a line on the bottom of the pages about an inch away from the outside edge of the book. This helps to keep all the page folds uniform. 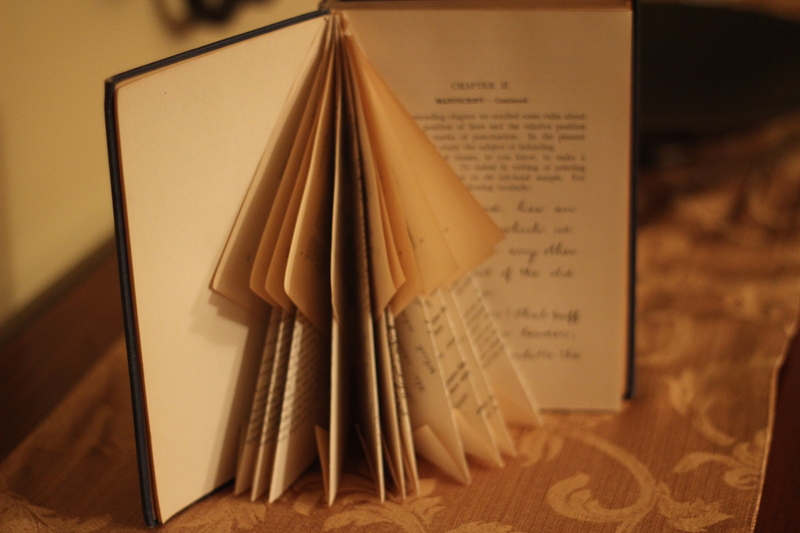 Begin folding in the beginning of the book. Each page requires three folds. The first fold is from the top left corner of the page to the line. The second fold is in the crease of the book. The last fold is up from the bottom even with the bottom edge of the book. Continue on through the book all the way to the back. As you go, the left side will get very bulky so you may need to keep cracking the book open so your folds will stay true to the center crease. I punched holes in the covers and added a ribbon to finish off the tree. That’s it. Give it a try or better yet, have the kids try it! For more fun ideas, subscribe to this blog and visit my website at WendyAmato.com. Happy Holidays! I’m using Little Yellow Bicycle’s 7″x6″ chipboard album with acrylic cover gift box-shaped album and Authentique Paper Company’s “Wonder” collection paper. First, I chose paper for most of the pages and rounded out the 25 with clear transparencies and vellum. I cut fancy edges with my corner rounders and edge punches then trimmed all the remaining square corners with my Corner Chomper. I dug deep into my old office tool box and used an adjustable hole punch to match the holes for the spine rings. Love those old office tools and supplies! They don’t make ’em like they used to. 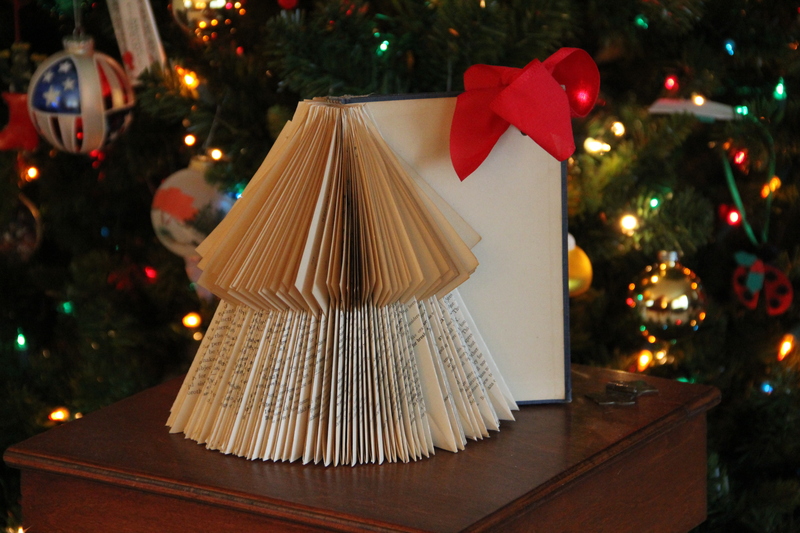 Next, I stacked all the pages and started making cutouts on pages that could then reveal a surprise on the next page. A circle here, a star there. Then, I cut some pages shorter to show off the edges on the next pages. I added the rings to give it one final look-over and now I’m ready to start embellishing the pages. Stashes are wonderful things. So much better for me than a closet full of shoes! Need red and green? No problem. Need sparkly? No problem. Ribbon, flowers, brads, plastic, glitter spray, ink??? Check! This project is starting out to be more fun than I anticipated and I’m not even at Day One yet! Stay tuned for my next post to see how I’ve put all this together to begin creating something wonderful. After all, it is that time of year.